How do you buy toys for a child who is both perfectly innocent, but growing fast? Are you struggling to make the transition from little one to big boy? Turning 5 is a big deal. It’s when our kids really begin to grow into their personalities. Now, they’re more capable of understanding the world around them. If you don’t know where to begin in choosing toys for your 5-year-old son, read on. I’ve compiled a list of my favorites and will tell you everything you need to know. Use the links above to check the latest prices or read our in-depth 5 year old toy reviews below. Buying age-appropriate toys for 5-year-old boys doesn’t have to be a hassle. All you need to do is follow the developmental milestones for this age. Although each child develops at a different pace, these milestones are general norms that most children achieve by a certain age. A greatly delayed milestone can alert you to the possibility of developmental issues. They’re a great reference when choosing toys. If you follow them, you won’t buy toys that are too difficult for your child to understand or use. Communicate clearly and concisely: This includes using complete sentences, varying tenses, story-telling, and relaying information, like names, addresses, and other details. Express emotion, personality, and empathy: Including wanting to be a part of a group, agreeing to rules and instructions, and displaying independence. They should also be aware of their gender, and be able to tell the difference between right and wrong, and reality and make-believe. Make sense of basic cognitive concepts: Namely counting, shapes, patterns, letters, and logic. Have an awareness of society: By understanding concepts like money, school, safety, and family. Perform physical actions: Including hopping, tumbling and rolling, jumping, swinging and climbing. Going to the bathroom unassisted and using a fork and spoon. Social toys and games: 5-year-olds can communicate effectively and develop a desire to play with others. Cooperative or even competitive games and toys can be introduced at this age. Simple strategic games: 5-year-olds should be able to follow rules and instructions. So long as strategic toys follow a simplified narrative, 5-year-olds should understand them without any problems. Don’t forget their motor skills: It’s still important for 5-year-olds to work on their motor development. Stationery, puzzles, and blocks are good options for fine motor. 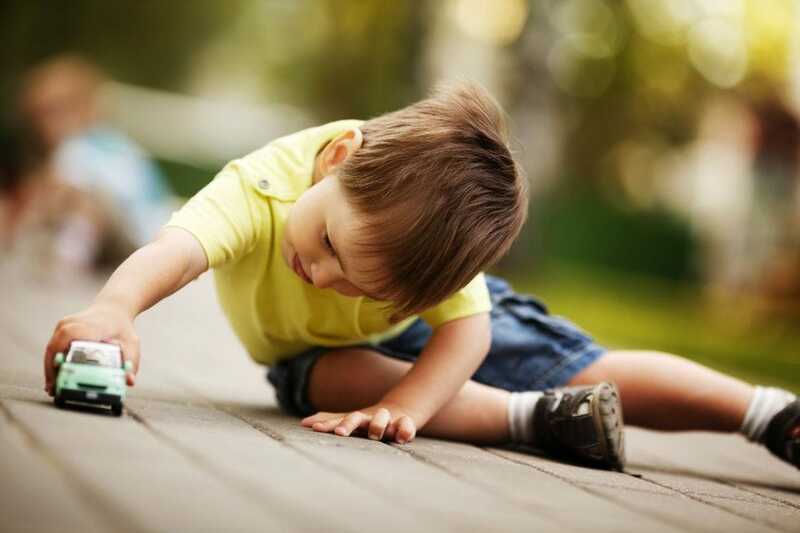 Balls, bikes, climbing frames or sports gear will develop their gross motor skills. 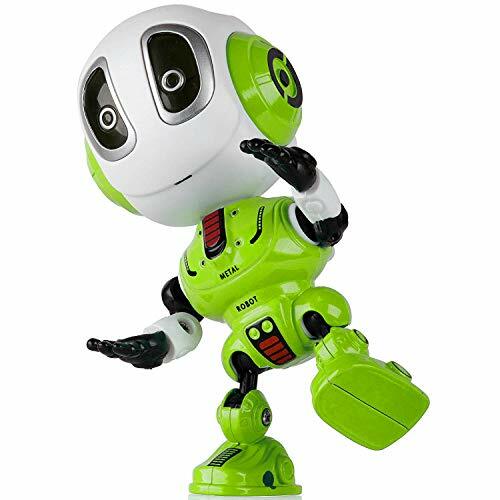 Creative and imaginative toys: 5-year-olds have strong imaginations and are often exuberant and energetic. Allowing them to express some of their energy through art, drama or music is an excellent idea. Should Toys Be “for Boys”? As you can see above, by age 5, your son should be fully aware of his gender. This means that he will be able to tell the difference between boys and girls, and know that he is male. We live in a complicated time when it’s no longer “boys get blue.” How much freedom and individuality you allow your son is up to you. For the sake of simplicity, the following toys are the stereotypical masculine ones. On that note, I’ve done all the browsing so that you don’t have to scour stores to find the best toys for your boy. I’ve narrowed it down to 21. These are my favorites. The fun thing about 5-year-olds is that they have an understanding of rules and cooperation. This means they can enjoy board games. What better game to start off with than Monopoly? It’s fun, it’s competitive, and it involves the whole family. 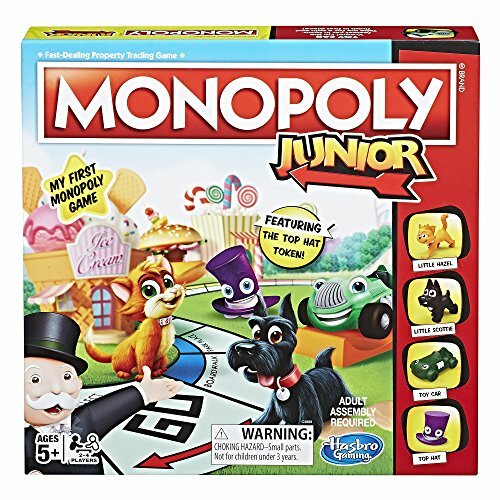 Monopoly Junior is almost exactly the same as the standard Monopoly, with a few alterations to make it more suited to younger kids. It includes child-friendly character tokens and simple properties and locations to buy, like the zoo, game arcades, or cinemas. Who’d have thought Monopoly could teach anything except how to screw your friends over? The Junior version can teach kids about partnerships, confidence, decision-making, and consequence. 5-year-old boys can be a bit dramatic. Their confidence starts to blossom, and their self-expression becomes energetic and imaginative. Their speech is also more concise, so this voice-changing mask could be a real hit for your boy. 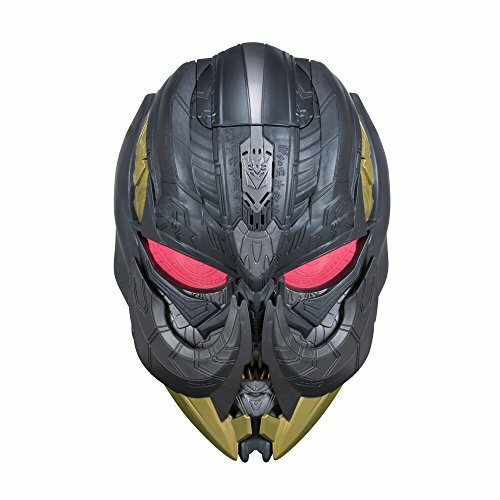 This Transformer mask has eight phrases and a soundtrack programmed into it. It has adjustable straps to fit any boy’s head, and batteries are included. Some parents complain that this mask is a little bit scary, but I think that makes it more fun. Megatron is one of those villains that everyone loves. Here’s another one that will bring out your boy’s personality. Your 5-year-old’s ability to tell truth from fiction will make this magic set all the more fun for him. He’ll know it’s a trick, but to him, you’ll be mystified. 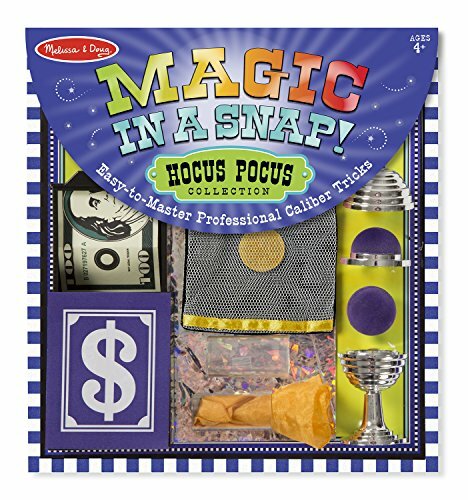 This set will teach your boy how to perform simple (but cool) magic tricks that are easy to learn and only require a few simple supplies. It has everything your son needs to get started. You get a disappearing coin, mesh bag, ball and vase, prop $100 bill, and a magician’s scarf. This magic set contains an easy to follow, illustrated manual. It has 12 pieces in total. Best of all, it’s an affordable option. Let’s face it, some parents are stuck in the dark ages and haven’t quite accepted that our kids are growing up in a world of technology. This Smartwatch is more intricate than you might think. It’s perfect for introducing your kids to the cyber age, without running the risk of exposing them to the online world. 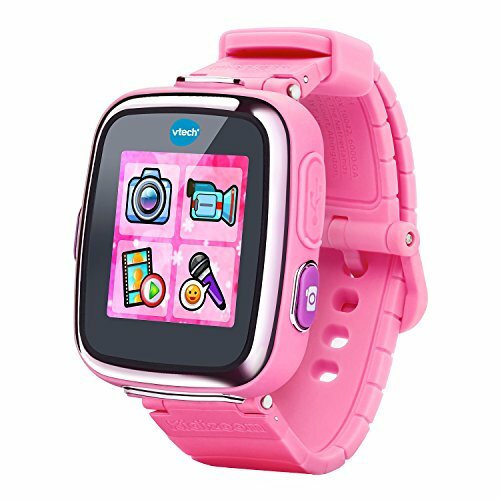 This watch has various games built in, including action challenges that work through a motion sensor. Your boy can take photos and videos with it. It also comes with an alarm, timer, calculator, voice recorder, and voice changer. You’ll need an iPad or iPhone for this one, but that’s the only downside to it. This STEM gamepad is a great educational toy, especially for school-ready kids who’ll benefit from learning at home. The gaming kit connects to your device and uses hands-on, story-based play to teach your kids about numbers and math. The set includes a foldable gamepad, a counting spike, an instructional manual, and tokens for numbers and operations. You’ll have to download the app, but once you do, you’ll have access to more than 250 math games. What an educational toy! Here’s one to get your boy moving. The objective is to use your body to launch planes as far, high, or ridiculously as you can. The stunt planes in this set were designed by real aeronautical engineers, so you know they mean business. 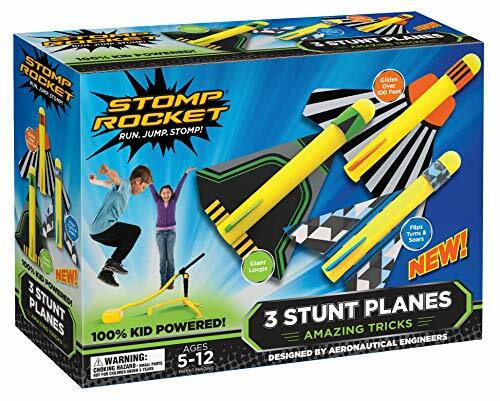 The set includes the launch pad and three different stunt planes: the Looper (which flies in a loop), the Glider (which can launch up to 100 feet) and the Wildcat, which does a bunch of tricks. This can be an indoor or outdoor toy. It involves planes, stunts, and stomping. What more could a 5-year-old boy want? This brain teaser game has a simple objective: stop a stampede by making the animals cross the river in the correct order. The player must figure out which order they go in. There are 60 different riddles and five levels of difficulty to choose from, so boredom is not an option. This is perfect for the developmental and cognitive skills of 5-year-olds. 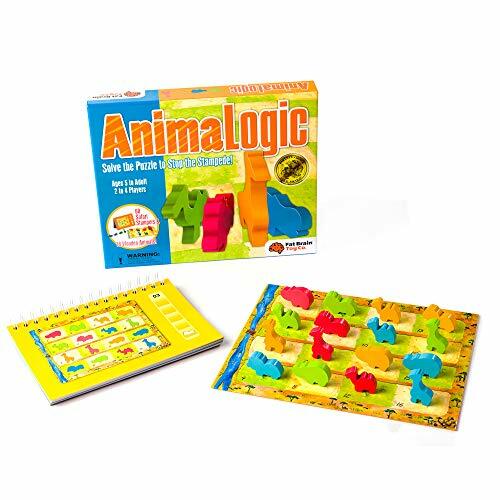 The game includes the board, 16 wooden animal pieces, solutions, a notebook, and a storage box. Here’s a game that requires math skills, is competitive, and 5-year-old boys are sure to enjoy. 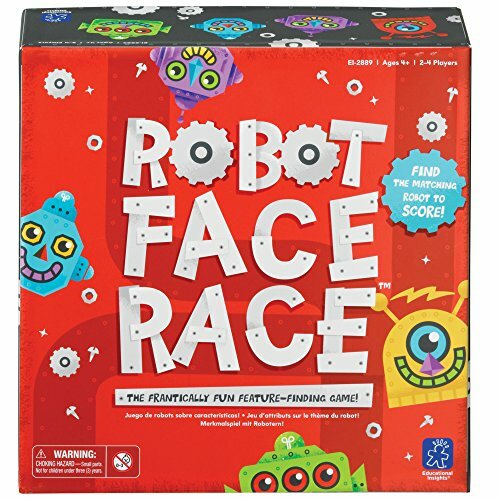 It’s a matching game, in which you match robot faces on the board to what’s depicted on the “randomizer.” It teaches kids pattern recognition, association, and cognitive reasoning. This game is enjoyable, whether your boy can read yet or not, and everyone plays at the same time. The board, 20 tokens, and the “robot randomizer” are all included. It sure looks fun, for two to four players that is. Here’s a classic with a twist. You might be thinking there’s nothing special about soccer, but Fisher-Price has (as expected) found a way to spice it up. 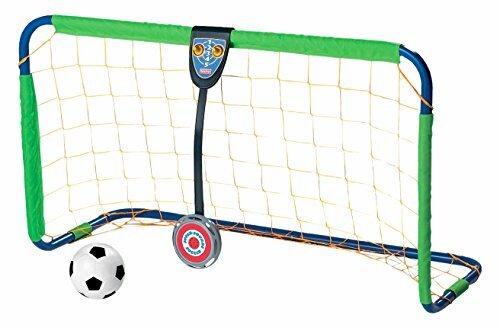 This soccer set up comes with a ball, net, and adjustable hanging target to make goal-scoring more challenging. It also has pre-recorded sounds to celebrate your goals, making it great for building confidence. It’s good for indoor (space allowing of course) or outdoor play. It’s suitable for either or one or two players as well. Can your 5-year-old ride a bike yet? It doesn’t matter, either way. This awesome bike comes with training wheels to use until your son finds his bike-riding feet. When he is ready to spread his wings, remove them and problem solved! Take your pick of various sizes, colors, and designs. 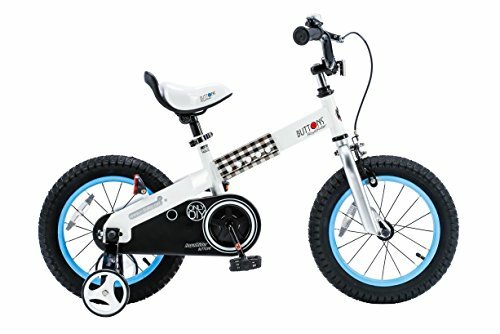 The 16-inch model is recommended as it gives your son room to grow without foregoing the safety of training wheels. It’s suitable for approximately 4 years up to 7 years old. This bike also includes a bell, assembly tools, non-slip pedals, and reflectors. It has a front hand brake and a coaster brake for extra safety. I’m in a superhero groove now. 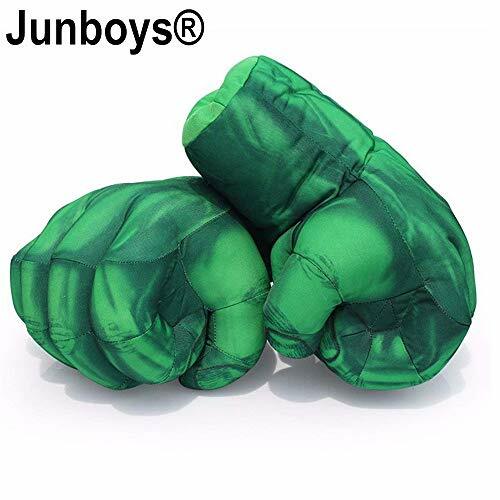 My nephew adores the Marvel heroes, so these Incredible Hulk smash hands really caught my eye. These gloves are made with polyester, so they’re not destructive and they cushion your boy’s hands so he won’t get hurt. They work as a toy, as practice boxing gloves, or as dress-up, if your little one is ever invited to (or throws) a themed party. They can also be decorative, adding a cool touch to your boy’s room. You also get a satisfaction guarantee upon purchase. Sometimes all boys need is a simple superhero figurine to play with. Often, we get caught up in the flashy, digital toys. It’s nice to go back to basics now and then. I like this Batman action figure because it’s true to the character, and it’s versatile. It’s 12 inches tall and has 11 points of articulation. Toys like these are great to develop your boy’s imagination, allow free play, and boost confidence. This Batman figure is part of a collectible series, so if your son is a DC fan, there’s more where this came from. 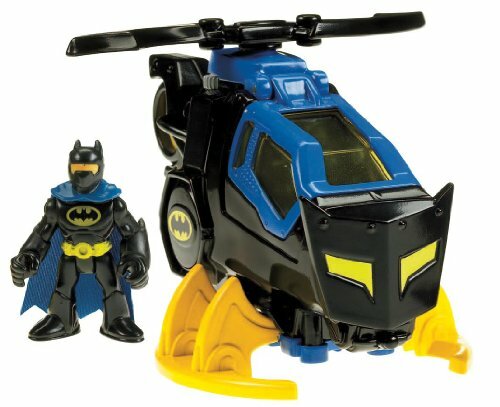 Speaking of Batman, here’s another fun one: introducing the Batcopter. If your son is more fascinated by vehicles than characters, this could be the perfect toy for him. Imagination comes easily with this toy (which is great for little boys). It has fully rotating helicopter blades and a landing gear that can scoop all the bad guys up. It also includes a little Batman figure. He’s not quite as stylish as the one above, but if your boy is more interested in the ‘copter, that shouldn’t matter at all. If bikes aren’t suitable for your boy yet, why not consider a scooter? Almost no skill is required to get started with them. They’ve been a staple in play (and for boys) since their invention. 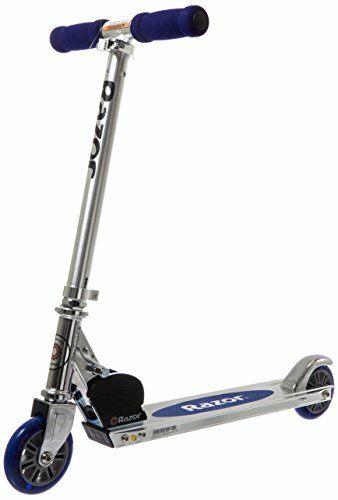 The scooter is made with aircraft-grade aluminum and has a patented design. Its brakes allow quick stops too, which is good to know. It can hold up to 143 pounds. The scooter has adjustable handlebars with foam grips. What a great way to get your child moving on wheels. 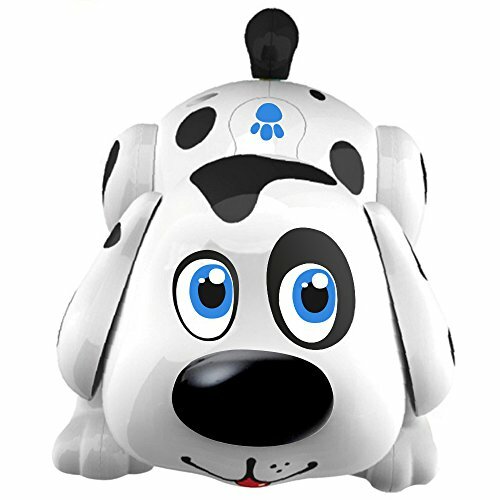 Meet Harry, an interactive robot dog that can walk, bark and respond to your touch. He’ll even do a song and dance routine for you if you touch his head. He’s a cute little pup, at 7 inches by 6 inches. You can leave him to his own devices or play with him. He’ll chase you if you allow him to. This is a great choice for your boys, and indeed families, who can’t have (or don’t want) real pets. It also works as a “practice” pet before you commit to a living one. Harry is adorable and a lot of fun. 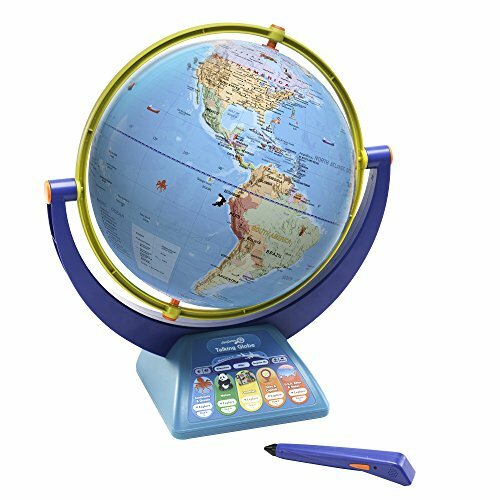 Expand your son’s knowledge of the world with this awesome and interactive globe. He’ll be able to learn more than a thousand facts about the world. Topics include animals and nature, countries and cities, continents and oceans. It comes with a stylus pen (batteries not included) that you can use to explore the globe and measure distances. There’s over 10 hours of interactive audio built in, and the best part is that it’s narrated by Bindi Irwin. You might get bitten by the travel bug, but it’s worth it. Adults have strong opinions on “Jurassic World” (don’t get me started) but kids, especially boys, love it. This play set is a great gift for fans of the movie, and dinosaur enthusiasts alike. 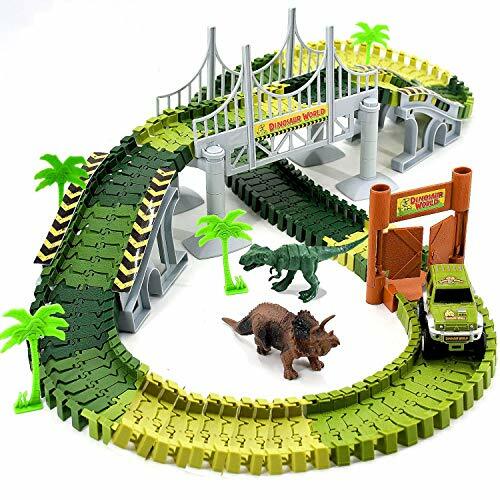 The dinosaur race track is versatile, with 142 pieces that can be set up any way you desire. It includes two dinosaurs and two racing cars, encouraging social play. It also comes with trees, slopes, a door, a bridge, and soldiers. Stickers are included for personalization, too. Easy to assemble and made from non-toxic plastic, this set should bring some excitement for your 5-year-old boy. I can’t have a list of boy’s toys (or any toys) without including the legendary Lego. 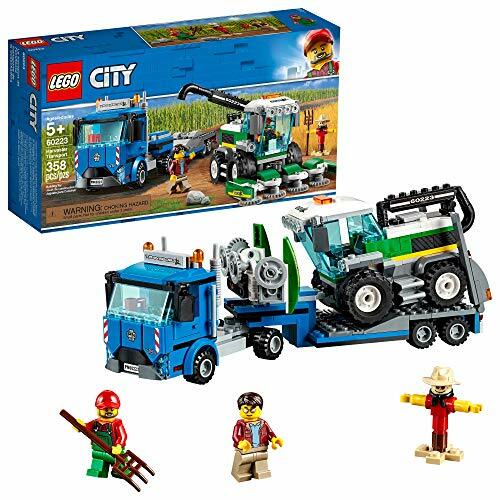 This set has 358 pieces, and since its theme is transportation, I think boys will love it. It includes a truck, detachable trailer, ramps, and a combine harvester. The vehicles can articulate too. It also comes with two characters: a driver and a farmer. There’s a scarecrow thrown in there as well. 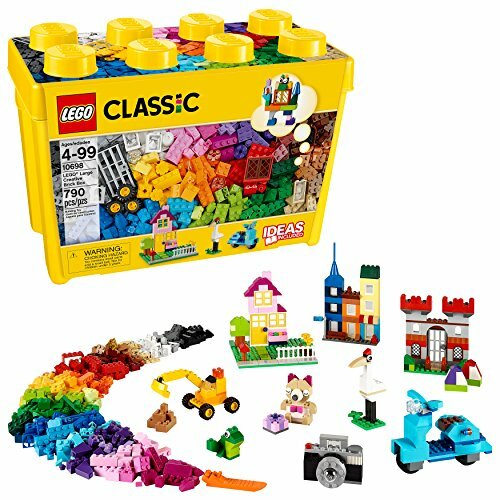 All pieces are compatible with other original Lego blocks and we appreciate the coming together of the countryside and city with this one. Perhaps your boy isn’t so interested in cars and farming. If that’s the case, why not revert to the classic Lego, and allow his imagination to run free? This massive Lego set contains 790 pieces of varying sizes, in 33 different colors. It includes two base plates, windows and doors, tires and wheel rims too. As above, all pieces are compatible with other Lego sets. The more original Legos (like this set) can be refreshing to play with. It’s simple, creative and you get your money’s worth. The big yellow storage box is both charming and functional. This bulldozer is such an innovative and great idea. Your little boy can take it apart and put it back together as many times as he likes. It promotes fine motor skills, hand-eye coordination, and reasoning. The set includes the toy screwdriver and assembly parts. 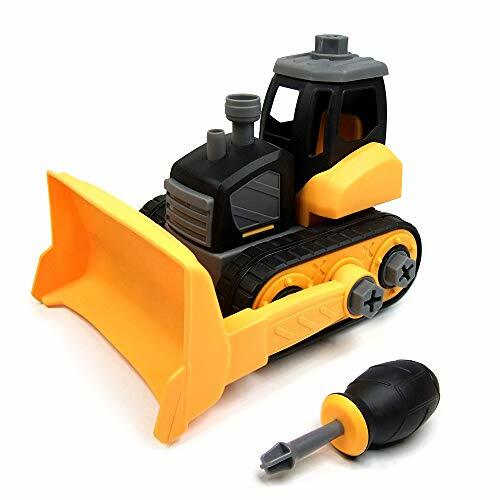 The bulldozer is made from durable, non-toxic materials. It’s designed for small hands, so your son won’t find this too challenging. It comes with a 100 percent satisfaction guarantee and a generous 3-year warranty. This toy was built to last. This interactive robot is fascinating. He records and repeats what you say to him, which can really help your child’s communication and expression. His joints can rotate a full 360 degrees, and you can twist him any way you like. He has flashing LED light eyes that change color when you speak to him. His batteries are included so you can have fun right out of the box. Different colors are also included in case your son isn’t a fan of neon green, but in our opinion, it’s super cool. We love boys of this age. They’re still little kids but becoming more curious about the world and more daring to explore it. Every one of these toys has something to offer, but ultimately I think that Monopoly Junior is the clear winner. It’s simple enough for 5-year-olds to understand, but close enough to the original that adults will still have fun playing. It’s different from other toys because it’s social, so you can bond with the whole family. It will also teach your son some valuable life lessons. Need I say more? Which of these toys are you most looking forward to buying? Do you have a favorite or others you’d like to share? Drop me a comment. I’d love to hear from you.